From L-R: Itamar Gero, President of ICCP; Yoray Ofek Levin, Board of Director, ICCP; Idan Segev, GM of CosmetiGroup Int’l Corp. And Ori Ofir. 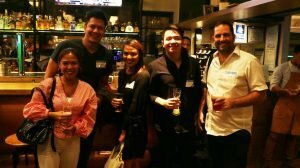 The young Israeli and Filipino community came together for the first ever Young Israeli and Filipino Professionals Meetup on September 6, 2017, at the Belle and Dragon Pub, Makati City. 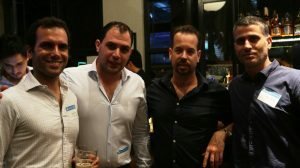 Led by the Israel Chamber of Commerce of the Philippines President, Itamar Gero and Board of Director, Yoray Ofek Levin, professionals from different industries participated and enjoyed a night of networking. The number of Israelis visiting the Philippines has doubled from 2014 to 2016. Trade activities between the Philippines and Israel have not been significant in the past decade, but the figure has increased from 2015 to 2016.